Heat oven to 350°. Cook macaroni as directed on package; drain. Cook sausage in skillet, stirring frequently, until no longer pink; drain. 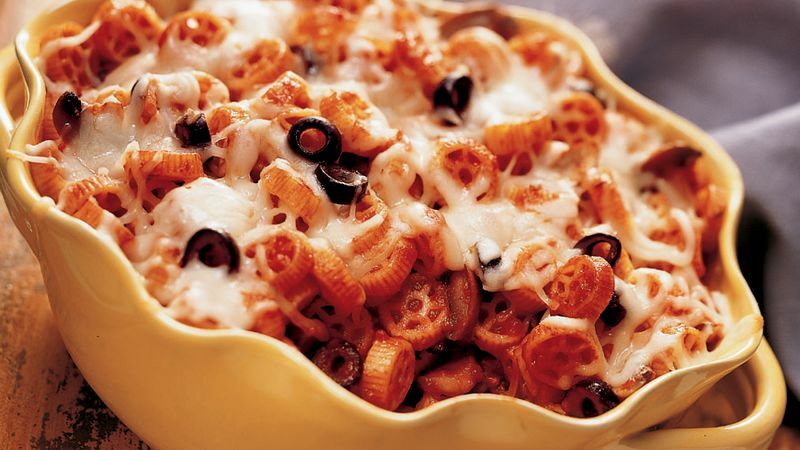 Mix macaroni, sausage, pasta sauce, olives and mushrooms in 2 1/2-quart casserole. Cover and bake about 30 minutes or until hot. Sprinkle with cheese. Let stand about 5 minutes or until cheese is melted. “When using any ground meat, I rinse it off in hot water after cooking to remove even more fat. I have found that the fewer ingredients in a dish, the less added fat it contains.” Nancy D.
Here’s a real all-family staple recipe. Studies confirm that a low-fat diet rich in milk, milk products, fruits and vegetables (pasta sauce counts as a vegetable!) may help reduce the risk of high blood pressure and other factors for heart disease.